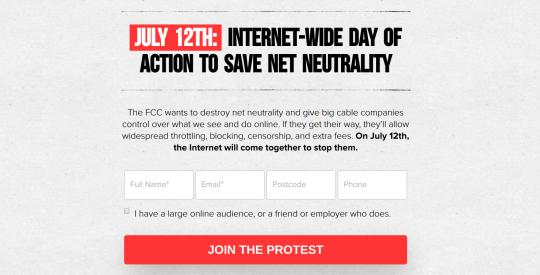 Spotify and ThinkGeek are the latest major players to announce their participation in the Internet-Wide Day of Action to Save Net Neutrality scheduled for July 12th to oppose the FCC’s plan to slash Title II, the legal foundation for net neutrality rules that protect online free speech and innovation. Twitter, Reddit, Netflix, Amazon, Kickstarter, Etsy, Vimeo, Private Internet Access, Mozilla, OK Cupid, Imgur, PornHub, Medium, and hundreds of other major sites are also participating. Yesterday, representatives for Facebook and Google told multiple reporters that the web giants plan to participate. Media attention for online mobilizations tends to focus on the big names participating, but there is a much more interesting story: a rag tag coalition of Internet activists huddled over their laptops in coworking spaces, home offices, and coffee shops, who are the ones who came up with the idea, called for, and organized the protest, and have since been working together to lay the groundwork, build the technical tools, and create the educational resources that make it possible for large and small websites to participate in these mass days of action. It’s a grassroots effort involving dozens of volunteers working together in Slack channels, outreach spreadsheets, endless email chains, organizing in online communities and forums, and an enormous amount of creativity and digital elbow grease.